Grab the clear skies while you can, seems to be fleeting moments between clouds for the past few weeks. Only managed a couple of Perseid meteors in the past 2 nights. Same time next year then for the dusty particles from comet Swift-Temple. Hence rushing out this morning and trying to image the sun between and through the clouds. So when I do finally get to have a look, there’s a couple of solar sunspots in the southern hemisphere. Still pretty quiet for a solar maximum. 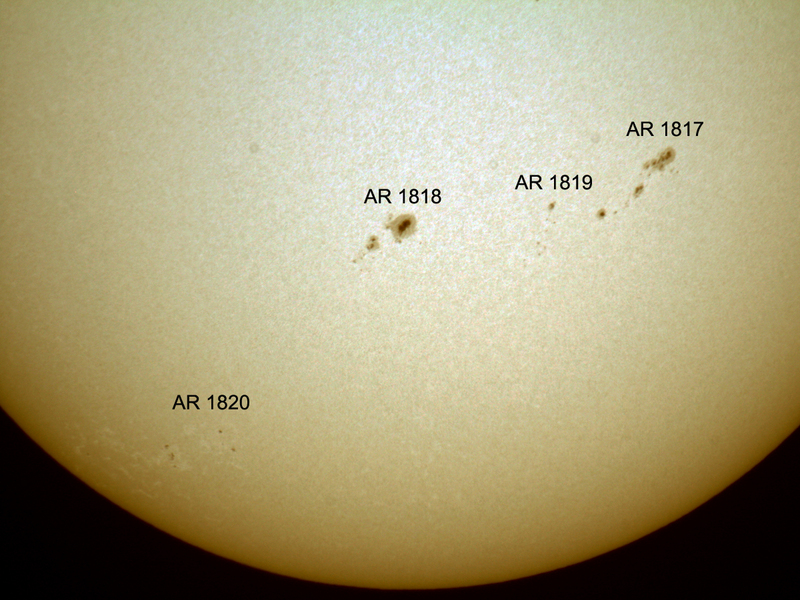 Sunspot regions active regions 1817 and 1818 now facing directly towards Earth and developing quite nicely. Final image is a single 1/500 sec exposure taken using a Canon DSLR 1000D and Baader solar film.